From the outset of development, Siren aimed to spread its wings throughout the world as a "made in Japan" game. What do foreign countries feel about the game, and how was it expressed to the players? Let us first reflect on events in our own country, and then turn to our neighbours Korea. 01 - The site's entrance. Miyako's desperate look, as though appealing to something she sees, set on a simple black background makes an impression. 02 & 03 & 04 - The available content includes story introduction and a making of, screenshots and "Strange Tales of Hanuda", with no huge differences to the Japanese version. Does the large eye in the top left of the screen belong to Miyako? The menu screen at the entrance to the official site. By clicking the buttons at the bottom, you can enjoy their content. In particular, "Strange Tales of Hanuda", side stories written by background/scenario head Ms. Sato, allows you to experience the game's theme of "something mixing fact and fiction", and gain a deeper understanding of the story. 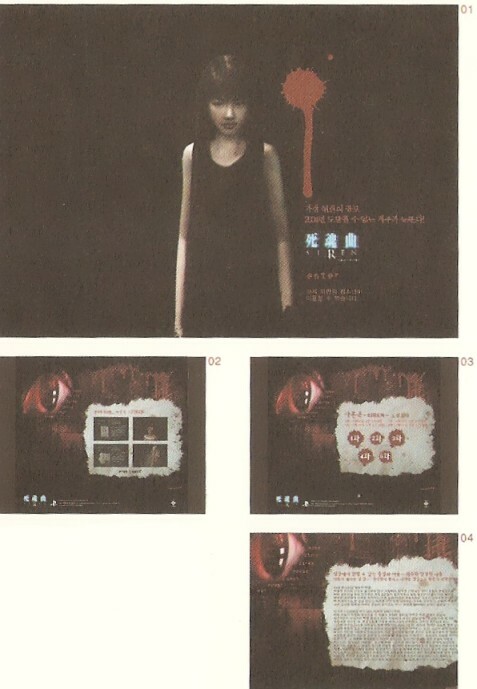 As Japanese horror films such as The Ring and Ju-On are garnering attention all over the world, Siren was released as a pure Japanese-style horror game. How did overseas players take the game, and how did the media show off its charms? In order to get an idea, we took a look at each region's official website. What had quite an impact on us was Sony Computer Entertainment Europe (SCEE)'s "Forbidden Siren" (the title of the European version of Siren) official site. It appears as though the team's fixation on never pandering to the users, always doing what they want to do in a straightforward manner and showing off a "Japanese-made" product struck a chord with SCEE's staff. Their feelings were taken closely into account, understood, and carefully expressed in this fine work. Mr. Toyama also seems to be impressed with the website, praising it by saying, "The site is really cool. We'll have to work hard, too." Inside it is an excellent event in which you receive an email from Kyoya Suda. We have touched on this in brief previously, but it is done in a manner that skillfully conveys Siren's symbolic theme of "mixing fact and fiction". This is not all, of course; by real world users communicating with the virtual Kyoya, they can feel closer to him, which plays the role of closing the gap between Kyoya and the player. If you have not yet visited this site, you are recommended to do so at least once. In particular, makers may sometimes close down their official sites, both domestically and overseas, without warning depending on the server situation. This means that it is key to visit as soon as possible. On the other hand, the Korean site, centred around Miyako and using red and black tones, has a chic look. The background, similar to Japanese paper, is a reminder that our two countries are in the same region.